Indium Corporation will be running its low-voiding solder products "Live@APEX" in more than 20 partner booths throughout the IPC APEX Expo technical conference on Feb. 14-16 in San Diego, Calif.
"Live@APEX," a joint effort between Indium Corporation and its industry partners, accurately and honestly depicts the performance of the company's materials in real time. 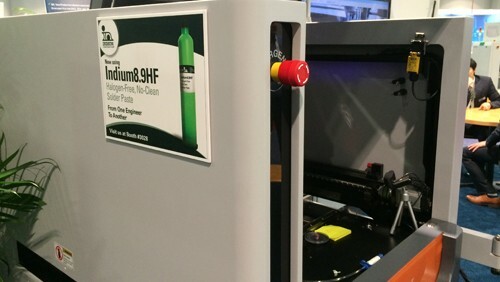 The program places Indium Corporation products into live equipment demonstrations on the APEX show floor. Mario Scalzo, Senior Technical Support Engineer, has chaired the program for 13 years. Scalzo has worked on hundreds of factory floors, formulated solder pastes and fluxes, actively participated in the manufacture of products, performed the tests, and run the trials. This experience gives him a full understanding of both the materials and the needs of customers. Through his efforts, the program has expanded to include the full range of SMT assembly materials, including solder pastes, fluxes, solder preforms, solder wire, and more. Live@APEX benefits all participants: Indium Corporation, the industry partners, and most importantly, the customer, who gets to see and experience the equipment and materials in a live-action environment. If you see an Indium Corporation product running in a booth, be sure to Tweet or tag @IndiumCorp and use the hashtag #LiveatAPEX. To learn more about the Live@APEX program, contact Mario Scalzo or visit Indium Corporation at booth #1011.